40,000 miles 40,000 Bonus Miles + Alaska's Famous Companion Fare™ Offer: Get 40,000 bonus miles plus Alaska's Famous Companion Fare from $121 ($99 fare plus taxes and fees from just $22) with this offer. To qualify, make purchases of $2,000 or more within the first 90 days of opening your account. Airline purchases. Earn the unique Famous Companion Fare deal from $121 ($99 fare plus taxes and fees from $22) and a sign-up bonus of 40,000 miles after a $2,000 spend in the first 90 days, then earn 3X miles on Alaska Airlines purchases. 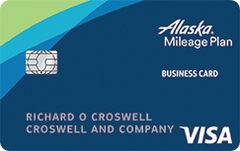 Our take: The Alaska Airline Visa Business credit card offers many valuable incentives for business owners, including a generous intro bonus and an annual companion fare.